Koh Tao (Turtle Island) is a tiny island in the Samui archipelago about 70km east from Surat Thani province. It can be reached by ferry from the mainland or from Koh Samui and Koh Phangnan. The island seems to exist only for diving and in the bars around the island that’s what most backpackers are talking about. It is the place in Asia to go and get your PADI dive certification, in fact more new divers are certified in Koh Tao than anywhere else in Asia. Part of the reason for this is the very cheap price of diving and partly it’s the laid back atmosphere on Koh Tao. Koh Tao diving is regarded as the best in the Gulf of Thailand. 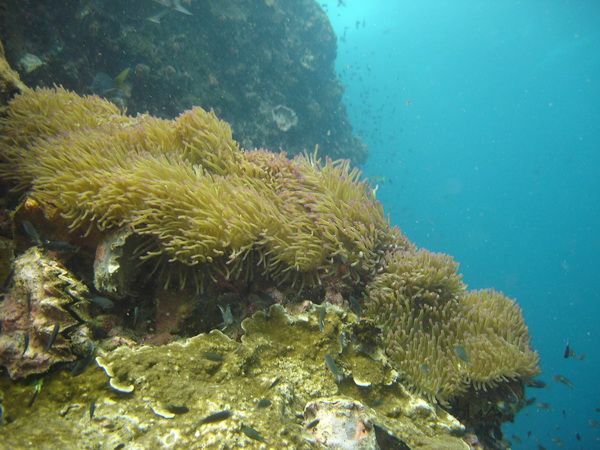 The best dive sites are Chumphon Pinnacles, Southwest Pinnacles and Sail Rock which are all excellent dives. many of the dive sites are very good for snorkeling, in fact because they are shallow, they may be better snorkeled than dived. Japanese Gardens by Koh Nang Yuan is an example. The diving is so cheap at Koh Tao that if you want to build dives and experience this is a good place to do it. The more dives that you do the cheaper it gets per dive. Accommodation on the island was once bamboo huts for backpackers but is rapidly moving up market. Expect the price of the diving to head upwards also. Green Rock: A submerged rock located 50m north of Koh Nang Yuan to the north west of Koh Tao. The rocks here form interesting swim-throughs, caverns and caves. Marine life includes the sometimes aggressive titan trigger fish, swim around them, not over the top of them, when they are protecting their territory. Maximum depth is 30m. Currents can be strong. Visibility ranges from 5-25m. Red Rock: Also called Nang Yuan Pinnacle also has some interesting swim-throughs. It is often dived from north to south, finishing on the Japanese Garden dive site, a shallow site with staghorn and table coral gardens that are in better condition than in other areas. Blue spotted stingrays may be seen in the sand. Banded sea snakes are occasionally seen on the reef. Twin Peaks is a good beginners dive site that reaches a maximum of 18m deep and has weak currents. White Rock (Hin Kao) is made up of two large granite boulders sitting on a sandy bottom at 20m and starting at 2m below the surface. Blue spotted stingrays can be seen in the sand. At 10m there is a coral garden with lots of fish life including butterfly fish, angelfish, puffer fish, cornet fish, groupers and moray eels.